I don’t know if this is how it is with other knitters but as a project nears the end I react in one of two ways. I may become over eager to see it finished and lose sleep staying up late to get a dozen more rows complete or ignore entire meals because they would interrupt the self-imposed requirement of knitting a certain amount of rows per day to have a garment done by an imaginary deadline. Or I may stretch out the process by diversions like I have done this time. All the knitting that remains on my Bressay Dress is the sleeves. I’ve decided to extend the sleeves from the cap style to something more of a long short-sleeved version that ends just above the elbow which is a little more flattering on me. One sleeve is off the waste yarn and two inches from the ribbing. But honestly, it was a trial getting the first sleeve that far along. It’s not that the knitting is boring, or tedious, or any real reason that is the fault of the project. It’s just that earlier in the week I’d dyed a new colorway in PathWays and the yarn had dried. It was pure temptation. 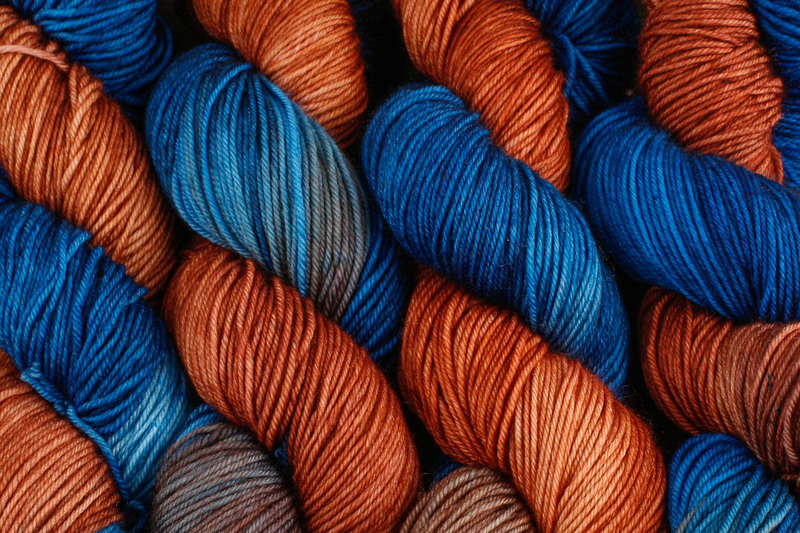 As I worked in the studio all day dyeing more yarn, labeling the dried yarn, and planning what would be dyed the next day I kept looking at the new colorway. When I labeled the first dyelot one skein was casually set aside for me to bring to my personal stash. I thought that would dampen the temptation. 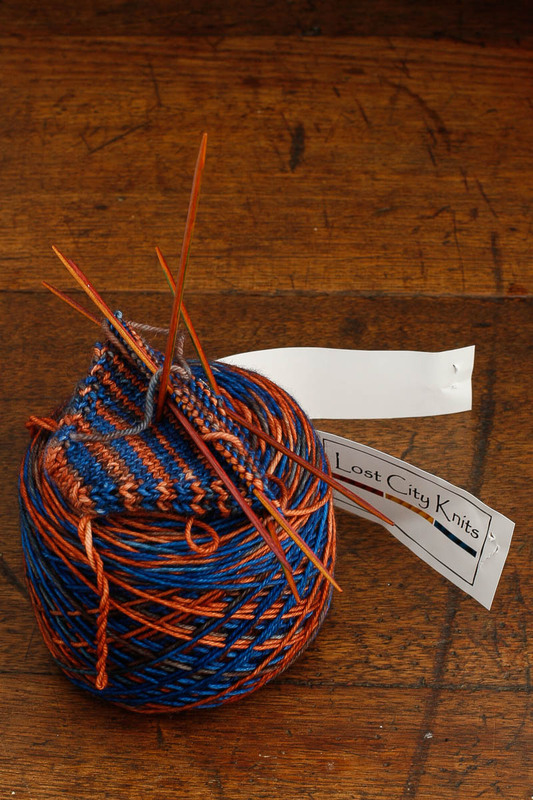 When I’d finished for the day the skein of sock yarn was sitting with my hat and mittens. Generally I don’t wind yarn until I’m ready to knit with it, but this being sock yarn different rules apply. I try to keep three or four skeins of sock yarn wound into cakes on hand in case a knitting emergency arises. You know the type – like when you’re rushing out the door and the current WIPs are all in that awkward place where they really aren’t right for travel. That’s when you want to just grab a cake of sock yarn and the needles and stuff them into a bag and you’re off. So I wound the new yarn into a cake before I left the studio to return to the house. It would be ready whenever I needed it. The new yarn didn’t make it into the big bag of sock yarn hanging on my office door. Nope. I grabbed the 2.25 dpns and cast on. Just Judy Becker’s Magic Cast On and the wee toe started, I told myself, and then I’ll stop. Then I told myself I really should get all of the increases done and then put the sock in a project bag and not have to bother with any more math. Not that I really bother with calculating math on a simple toe-up sock. I know it by heart with this yarn. 52 stitches give me a nice snug sock that fits well and wears well too. Now I am almost an inch past the increases. But I must put the sock aside and will focus again on the sleeves of my dress. Sleeves are a lot like socks, I know that. I’ve told countless people that very thing in reverse when I’ve taught them to knit socks. Socks are just like sleeves, I’ll say, only with a heel, a toe, and smaller needles. The Bressay Dress needs my attention if I want the knitting complete and the garment blocked in time for the first show of the year in less than a week. Holey Moley! Where did all that spare time go? That sock is going in a project bag – right now! I feel your pain – it’s hard not to bring things home from the studio – they sit there and taunt you! I know people who knit the sleeves first, because like you, they have trouble finishing them. So they get them right out of the way. Personally, I don’t mind sleeves – I like to make the biggest piece first – compared to that, the sleeves seem to fall off the needles for me.